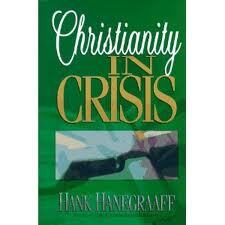 Several years ago I read the book Christianity in Crisis by Hank Hanegraaff of the Christian Research Institute. While I enjoyed the book immensely, others I talked to about it thought the book far too critical and controversial because of its nature of, as some have said, “airing other peoples dirty laundry.” The book exposes and documents some of the blasphemous teachings of popular faith movement preachers such as Kenneth Hagin, Kenneth Copeland, Benny Hinn, John Avanzini, Morris Cerullo, and a host of others. Today I sometimes hear from well-meaning brothers and sisters that I am also too critical in the way I address what I believe to be errors (and blasphemies?) in the modern institutional church. If my motivation is to correct errors and to lovingly restore the church to what it originally was intended to be, then my question is, “How can that be wrong?” Acts 17:11 tells us that even Paul’s words were not taken at face value by the Bereans without them first examining the Scriptures. Were they criticized for doing this? No, they were actually commended for doing so. What I noticed here is that Jesus commends them for testing and critically appraising. This may sound harsh, but Jesus is not against them for this, but rather commends them for taking such action. Jesus does rebuke the church at Ephesus for something else, but He first commends them for testing those who called themselves apostles. The result of the test is that these so-called “apostles” were found to be impostors and liars. If this was true already back then in the church of Ephesus, does it not stand to reason that the same thing could be true today? Of course it would, and maybe even more so today. As believers in the Lord Jesus Christ, we would be irresponsible if we didn’t warn other unsuspecting brothers and sisters of the false teachers and false church systems. Paul says, “Keep watch over yourselves and all the flock of which the Holy Spirit has made you overseers. Be Shepherds of the church of God, which he bought with his own blood. I know that after I leave, savage wolves will come in among you and will not spare the flock. Even from your own number men will arise and distort the truth in order to draw away disciples after them. So be on your guard!”(Acts 20: 28-31). Time and again the Bible warns us to be on guard against false teachers (see: Romans 16:17,18; 1 Timothy 1:3,4; 4:16; 2 Timothy 1:13,14; Titus 1:9; 2:1). Am I also simply “airing the institutional church’s dirty laundry” as critics of the aforementioned book claimed that Hank Hanegraaff had done? Maybe. If so, however, then it is only because we are called by Scripture to do exactly that. In 1 Timothy 4:6 we are instructed, “If you point these out to the brothers, you will be a good minister of Christ Jesus, brought up in the truths of the faith and of the good teaching you have followed.” Do we want to be good ministers of Christ Jesus? If so, then one of our key tasks must be pointing out error and false doctrines in and effort to promote the truth of the Gospel. People don’t always want to hear that, and they may even be offended if they’ve come to believe the lie. However, “Am I now trying to win the approval of men, or of God? Or am I trying to please men? If I were still trying to please men, I would not be a servant of Christ” (Galatians 1:10). What is the lesson here? The lesson is that the institutional church and her leaders need to be constantly put under the microscope and examined in order to keep the church (Christ’s Body) pure. The fact is that there will be wolves in sheep’s clothing that will constantly creep in among us. The fact is also that there will constantly be tares growing up among the wheat. We need to be aware of this problem. How are we to do that? We become aware by constantly “testing and critically appraising” (Rev. 2:2). Why do we do this? We do so because we are called to “point these out to the brothers” (1 Tim. 4:6). On another note, anyone can point a finger at another and call them a “false teacher.” Many have done so. My goal is not to personally point fingers at individuals, but rather to encourage you, my readers, to also be like the Bereans (Acts 17:11) with regards to personally examining the Scriptures for yourselves to see if what I say is not true. Please do not just blindly take my word for either; prayerfully look up the Scriptural references for yourselves. Do we believe that the Bible is the “Word of God?” This is either true or it is untrue. If it is untrue, then our faith is a sham and we collectively as a group are nothing more than a social club. However, if we believe that it is true, then we can and must use it as a guide for everything pertaining to our faith. Therefore, when the Bible says something is so, we must take it at face value and believe that it is in fact so. When an institutional church system operates in ways that are not found in the Bible, or are blatantly contradictory to it, then we must speak out against it. Finally let me say that we do not want to further faction the Body of Christ. If anything, the reverse is true. What we are after is mending and restoring the truth of the faith so that in the end, we can all truly be one (John 17: 20-23). If error is left to continue on its present course without any opposing voice, then we will never see that day. Religious confrontation is never politically correct, but the alternative is a Body of Christ that is so factioned that in truth it is no longer even a body at all, much less the Body of Christ. The last word belongs to the Apostle Paul. “Those who oppose him he must gently instruct, in the hope that God will grant them repentance leading them to a knowledge of the truth, and that they will come to their senses and escape from the trap of the devil, who has taken them captive to do his will” (2 Timothy 2: 25-26).